Welcome to our Sterling Silver Gifts Collection of fine quality Kosher Judaica and exquisite designed silvery, for your home and office. 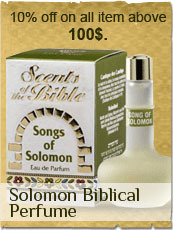 Find here Silver Judaica, Silver miniatures and figurines, silver gifts of the Holy Land, silver jewelry and much more. All of our silver products are Hallmarked. 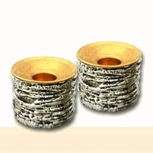 Find here the best of sterling silver Kiddush cups. Our amazing Judaica of Hallmarked sterling silver Kiddush cups are kosher and made in Israel. Our sterling silver Kiddush cups are second to none. Find here the best of Sterling Silver Sabbath Candlesticks. Our amazing Judaica of Hallmarked Sterling Silver Sabbath Candlesticks is Kosher. Our Sterling Silver Sabbath Candlesticks are specially designed with Jewish decorations for the innovative and traditional Jewish taste. 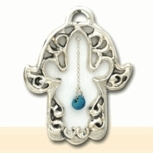 Have a glimpse into our Sterling Silver Mezuzah Collection. Every Sterling Silver Mezuzah in our collection is genuinely hallmarked and uniquely decorated Jewish ornaments. Find here great collection of channukias for the Jewish holiday call "HANNUKAH". All Chnnukia collection is made from sterling silver by Israeli Artist. surprise your family and friend with a nice, unique and high quality gift. Find here nice collection of sterling silver Torah pointers (Yad) and Siddur prayer book for decoration. all made in israel with hight quality sterling silver. Our Silver Animal Figurine collection is offering artist designed Hallmarked sterling silver statuettes of your favorite animal. Enjoy our great collection of Animal Figurine. Sterling Silver Shabbat wine items – Shabbat wine stoppers and bottle holders. 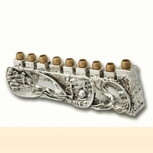 Adorn your Shabbat table with a great silvery piece with delicate Jewish decorations. Get ready for the Kiddush, get ready for the Bore Pri Hagafen. Sterling Silver Home Blessings – Wall Hanging Judaica art of Jewish Blessings for the home. Wonderful Hallmarked Sterling Silver Judaica to bless your home and family. Blessings of joy. In this category you will find various design of Honey dishes ans Saltshakers. all made by Israeli artist. High quality sterling silver. Find yourself a fine honey dish and salt shaker to decorate your family table. nice gift idea for your family and friends. Come visit our wonderful Callahan knife collection. here you will find various knife design like: Wheat knife, Jerusalem knife, Sabbath knife and more. All Sabbath knife made in Israel by Israeli artist. High quality sterling silver. Adorn your Sabbath with this unique Bsamim. 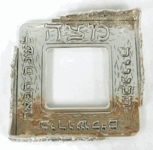 Transliteration: Barukh ata Adonai Eloheinu melekh ha‑olam, bo're minei b'samim. Translation: "Blessed are You, LORD, our God, King of the universe, Who creates varieties of spices." The spices are then passed around and smelled by those present. Made by Israeli Artiest. High quality sterling silver. Find here hallmarked Silvery of Kosher Judaica gifts for the Sabbath table and for the Jewish festive feasts. 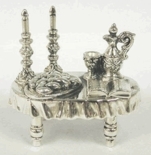 Amazing pure silver salt and pepper holders, napkin holders for the havdalah and much more sterling silver items to decorate the festive Sabbath table. With this Brooch category you will find a great collection of unique brooches. Among them you will find: flower brooch, animal brooch, flags and more. All brooches made from high quality sterling silver by Israeli artiest. in this category "silver choker necklace" you can find beautiful collection of sterling silver necklaces. Suprise your wife and girlfriend with a wonderful necklace from the holy land of Israel. High quality products. Find here a great collection of scarf holder made from sterling silver. you will find various design like|: Jerusalem scarfs and elegant clean design. all scarfs holder are made in the holy land of Israel. best quality products made from sterling silver. Find here wonderful collection of Rosh Hashana Miniatures. All miniatures made from sterling silver by Israeli artiest. This collection include miniature like: Happy New-Year, Shanna Tova, Hatima Tova, Shofar, Torah and many more. Great collection of Channukah miniature made from high quality sterling silver. All product made from high quality Silver by Israeli artiest. Various design shape like: hannukia, candles,tree of life, hannuka table and many more. Hanukkah also known as the Festival of Lights, is an eight-day Jewish holiday commemorating the rededication of the Holy Temple (the Second Temple) in Jerusalem at the time of the Maccabean Revolt of the 2nd century BCE. Hanukkah is observed for eight nights and days, starting on the 25th day of Kislev according to the Hebrew calendar, which may occur at any time from late November to late December in the Gregorian calendar. In this category you will find very unique Pesach miniatures. All made by Israeli artiest with high quality sterling silver. The category include different design and shape like: Pesach plate miniature, seder plate miniature and more. In this wonderful section you will find items related to Lag Baomer (Jewish Holiday). All products made by Israeli artiest from high quality sterling silver. In "Shavout Miniatures" category you will find various design and shape related to the jewish holiday "Shavout" like: 10 commandments, Megilat Ruth, Shavout table and more. All miniature made from high quality sterling silver by Israeli artiest. This category contain blessing miniature collection designed from high quality sterling silver by Israeli artiest. Designed in different shape like: Home blessing miniature, Mazal tov Miniature, Eshet Hail Miniature, Congratulation miniature and many more. In this category collection you will find a fine Shabbat miniature items. All products made from sterling silver by Israeli artiest in various design: Sabbath candle miniature, Wine cup miniature, Sabbath spices miniature, Challa miniature and many more. udaica miniature collection of sterling silver Judaica themed miniatures. All of our hallmarked silver Judaica miniatures are designed by Israeli top designers. Find in "Silver Dollhouse Miniatures" category beautiful collection of small birthday cake, computer miniature, doctor bag miniature, ice cream and more. all miniature made from sterling silver by Israeli artiest. Find here great collection of "Silver Dollhouse Furniture" among them you can find: Coach, chairs, table, sofa, cabinet, clock and many more. all are made from high quality sterling silver by Israeli artiest. Miscellaneous Sterling Silver Gifts for your office and home. One of my favorite collection. Here you can find beautiful Music instruments miniatures like: Harp miniature, Saxophone Miniature, Cello miniature, drummer miniature and more. All Miniature made by Israeli artiest from high quality sterling silver. Lovely category that contains Professional miniatures like: pilot miniature, doctor miniature and more. design and shape by Israeli artiest. made of high quality sterling silver. Great gift for friend and family. Find here great collection of fine famous Jewish and Israel places: Holy temple miniature, Rachel Tomb miniature, Israel Map Miniature and more. All Miniature made from sterling silver by Israeli artiest. Are you a chess lover? Do you love play? Do you collect Chess sets? This category designed special for you. Here you can find various chess design and shape: Biblical chess Miniature, IDF Chess Miniature, Sabbath Chess Miniature. All chess model are made from sterling silver by Israeli artiest. Great collection of "Silver Card Holders". This category contains card holder miniature in different design and shapes: Jerusalem card holder miniature, pomegranate card holder miniature, business card holder miniature and more. All products made from high quality sterling silver by Israeli artiest. Great gifts for your family and friend for the upcoming holidays. 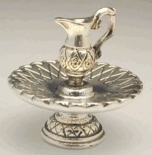 In this category you will find great collection of sterling silver Inkwell miniatures. All Miniature made by Israeli artiest. Great gift Idea to your husband office. This category contain unique silver clip holder: Car clip Holder, Noah clip holder and more. All Clips made from high quality sterling silver by Israeli artiest. Best office gift for your friends and family. In this beautiful category you will find very unique design of silver pen holder. All pen holders made from high quality sterling silver. Direct from the holy land of Israel. Nice gift for you friends and family to decorate their offices and business work place. 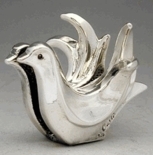 Category of Silver Paper weight: Jerusalem paper weight, dove paper weight,pomegranate paper weight and more. All Paper weight made from high quality sterling silver bu Israeli artiest. surprise your father with this amazing office gift. "Mazal Tov". 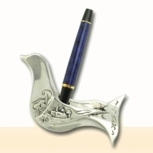 This category contain fine silver letter opener in different design and shape: Pigeon letter opener, Jerusalem letter opener and more. All letter opener are made from sterling silver by Israeli artiest. great gift idea to decorate your table office. This category include nice collection of sterling silver paper holder in different design and shapes: Memo note pad holder, Jerusalem not pad holder and more. All paper holder made from sterling silver by Israeli artiest. This category contain wonderful silver book mark in different design and shape: Flower bookmark, Leaf bookmark, Car bookmark, Artisan Bookmark All made from sterling silver. This category contain beautiful collection of Magnets: Dover magnets, sun magnet, abstract magnet and more.. All Magnets made from high quality sterling silver By Israeli artiest. great gift to decorate your friends and family refrigerator. A great collection of artistic pure Silver Key Holders. All of our pure silver Key Chains are hallmarked and made in Israel. Great collection of genuine Hallmarked Sterling Silver Judaica pieces of framed wall decorations. It's no secret how this powerful art can improve your home spirit. This category contain different types and design of Silver Beads : Green bead, Red bead and more. All Beads decoration made from high quality sterling silver by Israeli artiest. Great gifts for friends and family. This category contain different types and design of Silver Fruits Miniature: walnut miniature, silver acorn miniature, penguin miniature, lemon miniature and more. All Fruits miniature are made from high quality sterling silver by Israeli artiest. Great gifts for Fruits lover and collectors. This category contain different types and design of Silver Vegetables Miniature: cucumber miniature, silver garlic miniature, scallion miniature, tomato miniature and more. All Wild Vegetables miniature are made from high quality sterling silver by Israeli artiest. Great gifts for Vegetables lover and collectors. This category contain different types and design of Silver Israeli Flowers Miniature: palaver miniature, silver papyrus miniature, violet miniature, sunflower miniature and more. 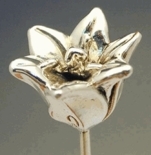 All Israeli Flowers miniature are made from high quality sterling silver by Israeli artiest. Great gifts for Israeli Flowers collectors. This category contain different types and design of Silver Mother Miniature: lovers on bench miniature, silver mother sitting with her child miniature, mother with baby miniature and more. All Mother figurine are made from high quality sterling silver by Israeli artiest. Great gifts for your family. This category contain different types and design of Silver Judaica Miniature: Hasidim Jew dancing miniature, silver fiddler on the roof miniature, rabbi tovia the-milkman miniature, peace-dove miniature and more. All Judaica miniature are made from high quality sterling silver by Israeli artiest. Great gifts for Judaica collectors. This category contain different types and design of Silver Christian Figurines: the-nativity, the prodigal sons, Jesus walking on water, an escape to Egypt and more. All Christmas Gifts are made from high quality sterling silver by Israeli artiest. Great gifts for your friends and family. Shiny collection of exquisite quality Sterling Silver figurines with the Israeli Defense Forces and the Israeli Air Force symbols. 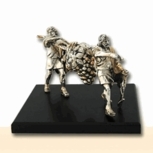 All of our Silver IDF Figurines are handmade, hallmarked and made in Israel.